I said last time that there would be more images by non-Japanese designers in this series, and here we are already! And who do you think this one is by? Although my printmaking schedule this year is extremely tight, I did manage to 'escape' from my workbenches for a week in July; I flew over to Vancouver, Canada for a short family get-together, partly instigated by my parents' 55th anniversary. 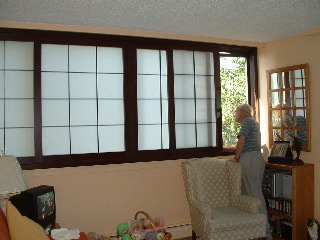 Not everybody could get there (oldest daughter Himi is working on a cruise ship in the Caribbean), and nothing much happened, but we did have a most relaxing week, taking walks, doing crossword puzzles together, and admiring the new shoji window screens my father has built in his apartment. Everywhere I went during the week, I kept my digital camera always with me; I knew that the moment I returned home I would have to start carving the next print, so during all our walks I kept a lookout for a scene that might make an interesting print. As it turned out, I returned to Japan empty-handed; I just hadn't come across anything that I felt would be suitable. Waiting in my email inbox at home though, was a message from my sister letting me know about a web camera which showed the view from an apartment block very close to her home in Vancouver. Using my computer, I was able to see the live image from the camera, and as I watched it change minute by minute, realized that a very nice evening scene was rapidly approaching. That scene reminded me of many beautiful evenings I had spent in Vancouver, so I reached into my memory, put a few ideas down on paper, and the next morning I started work on this woodblock print. I don't know how realistic it is, but I hope you enjoy it! I am going to Vancouver this week and will go and see if English Bay actually looks this good! Nice job as usual! They are really little jewels. Very nicely done! Who's the artist? For years now, Dave has denied his artist-hood. "I am but a craftsman..." With this print, that position seems to have lost what little credibility it had left. Some time ago, Watanabe Shozaburo oversaw the production of a couple of prints from photographs, attributing the artist as "Watanabe Kako", creating a new go for himself. I think that this was appropriate. The rendering of a video or photographic image into a print is the work of an artist. That's my take on it. > For years now, Dave has denied his artist-hood. "I am but a craftsman..." With this print, that position seems to have lost what little credibility it had left. > The rendering of a video or photographic image into a print is the work of an artist. That's my take on it. Appreciate the kind comments ... thanks! But you know, I'll still try to disagree with you ... let me try to use an analogy ... perhaps this is stretching a point, but think about athletics. In any sport you can mention, we can see plenty of people who are really good at the game - they have practiced it for years, they have a good natural 'feel' for it, they enjoy doing it ... and they are good at it. That's me, I think. And then, in any of those sports, there are also those (few) people who are all of those things I mentioned, but plus something else ... they have some kind of special 'sense' about their sport - they create plays that nobody else could have come up with, they are perhaps lighter on their feet that seems humanly possible, or they just somehow seem to float in the air above everybody else ... you know the kind of person I mean. When I say that "I am not an artist", what I am trying to get across is that I consider myself (and really feel this inside) to be a 'standard' competent craftsman in my field ... a technician. (Notice that I never use the word 'just' in that phrase - you will never catch me calling myself 'just a craftsman'). When I think of an 'artist', it's the other kind of athlete that I think of ... the one who works on a completely different level from the rest of us. I think that the kind of work that I do could have been done by any one of a zillion competent craftsmen of the woodblock printing tradition (barring my quirk of doing both carving and printing, which is/was very unusual, of course), and if you decided to pick the Meiji time for the comparison, it would have been done far better than I do it. What those men couldn't do, nor can I, is come up with the content ... the original conception. Yes, of course there are 'artistic' aspects in what those men did, and in what I do. It all depends on how you construe the word ... a plumber can be an artist in his field, if you want to use the term that way. So not to reject your appreciation of the things I create - knowing of your deep experience with the shin-hanga genre, I'm very glad that you found this print enjoyable - but I think you would have to admit along with me that a print like this doesn't really plumb any depths ... it's a simple 'pretty picture'.